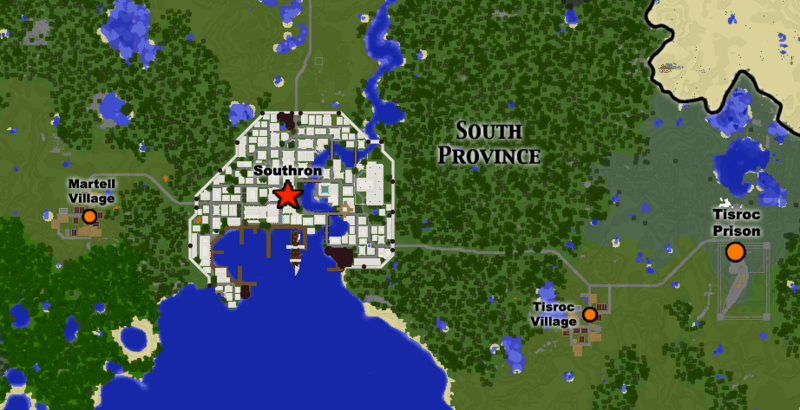 The South Province consists of a large city, two NPC villages, and a massive prison built by my friend Perry. Southron is constructed almost entirely of quartz, earning it the nickname “The White City”. The White Palace in Southron is my single largest stand-alone structure. Also in Southron is a large ship in the harbor built by my friend Chas. Southron was built to be a “far-away” place, but in the end wasn’t quite as far away as I had planned. It was the first true coastal city on my main continent. The South Province began as the City-State of Southron, a far-away land on the south coast. It is ruled by the King of the West, from his large palace that overlooks the glittering White City. Southron is similar to Dorne from Game of Thrones, in that it has different views on sexuality. The city is full of brothels and prostitutes, but they are much classier than in most locations. The province is also home to the world’s largest prison, Tisroc Prison. If you are being locked away for heinous crimes, this is where you end up, locked away in a ravine. At the very bottom of the prison resides the first inmate, a dragon. © 2019 Minecraft: Alpha	. Design by SkyRaptorThemes.